It has always surprised me how many Italian tailors say they can’t source good, unpolished horn buttons. Particularly because, since its launch last year, even customers can buy them from UK distributor Bernstein & Banleys (TheLiningCompany.co.uk). B&B has a good selection of horn - in different shades, with two buttons or four - plus stag, mother of pearl and corozo. There is also a small selection of vintage button sets, and a new range of solid-gold blazer buttons that launched last week (making steps shown below). That lack of awareness among Italians is doubly surprising given that the vast majority of buttons for bespoke tailoring, including 99% of the range at Bernstein & Banleys, are made in Italy. England used to have a strong button industry. But sadly the last British manufacturer, James Grove & Sons, went bust back in 2012. It was over 150 years old. Jonathan and I met for the first time a couple of weeks ago, over coffee. His daughter has recently joined the business, and is trying to get them talking more to the press. Bernstein & Banleys is one of two big suppliers of linings and trimmings left in the UK - the other being Richard James Weldon. Jonathan began his career as a commodities trader in the city, joining B&B (his father’s business) in 1989 after traders took a hit during the recession. Back then, there were around 12 large trimmings suppliers in the UK, and 95% of the product was made in the UK. “Gradually the others began sourcing from China, and chasing the low-end, volume market. They eventually went out of business - just leaving the top end,” says Jonathan. 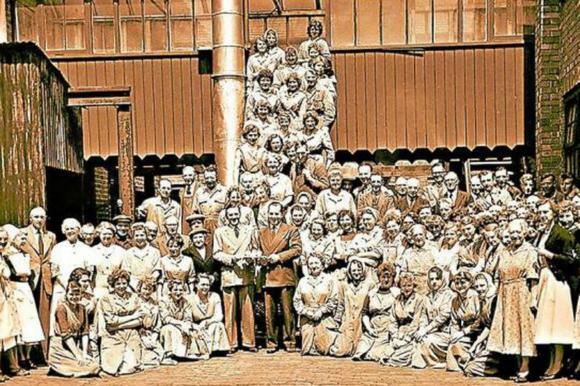 Like many merchants and suppliers, B&B used to be located close to their customers in the West End. They were on Newburgh Street, then Cork Street, before moving to north London - and since 2010, have been in Southend on the coast. Fortunately, for the top end of the market, business has been good recently - partly driven by costume in the film industry. Bernstein & Banleys supplied a lot of trimmings for Game of Thrones, as well as Harry Potter. Recent trends in the lining market have been more stretch fabrics (for womenswear) and more cottons (for vintage-inspired pieces). I’ve always liked matte horn buttons on tailoring, because they feel so different to ready-made suits. Savile Row tailors have traditionally used them, and often two-hole versions - which again separates them from RTW. Italian tailors, by contrast, tend to use corozo and polished horn - partly because they like the fact that it is more similar to designer RTW brands. This perhaps says something both about how the countries’ tailors see their prestige, and how big the domestic menswear industries are. I’ve bought a few different ranges from B&B (particularly shade 159-03, above), and plan to use them to replace polished horn on my Italian suits. I may also do so with corozo. I tend to only like corozo when it is paler and colour, and so you can see the natural ripples in the material. The hardest colour to get in horn is grey, but it is possible. 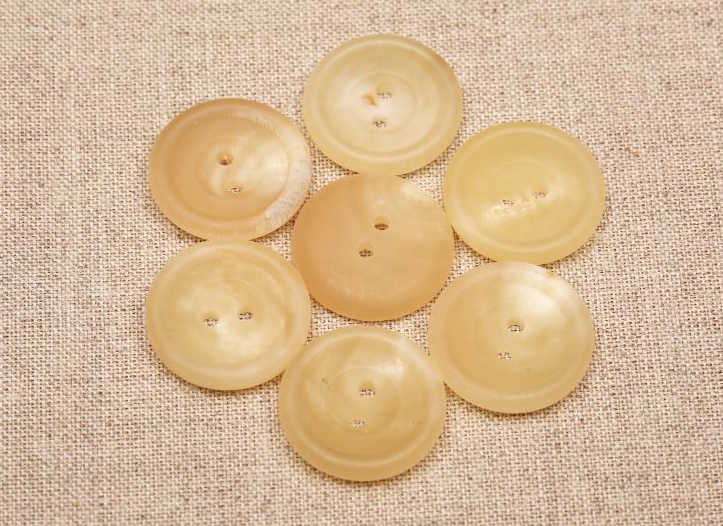 Makers just take the palest, tan-horn buttons (below), and dye them. Grey-horn buttons tend to have les pattern and variegation in them as a result. On the subject of buttons, The Vintage Queen in London also now sells its vintage collection online - see site here. I previously profiled The Button Queen back in 2014, and used some domed buttons originally on my bespoke Gieves & Hawkes pea coat (below). Good times for anyone looking to source great buttons on their own - and avoid the lack of awareness among tailors. Photography: Top, courtesy of Gieves & Hawkes; bottom courtesy of Troubadour; suit cuff, Jamie Ferguson @jkf_man; others, Bernstein & Banleys. You can follow the discussion on Buttons online – Bernstein & Banleys by entering your email address in the box below. You will then receive an email every time a new comment is added. These will also contain a link to a page where you can stop the alerts, and remove all of your related data from the site. First comment, you do a great job here. The fact is there were lot of small local companies here in Italy making buttons. Many were family’s based. Almost them all disappeared with the ongoing crisis and the cheap imported buttons. Add to this the very low presence on internet of the remansing makers (many don’t even have a site here) and you can understand why they say it’s so hard. I do buy brass, old styled buckles for my hobby. Can’t find any here in Italy and found a great shop in Germany only to discover later that those buckles were made in Italy! Which buttons work on navy or grey suits? How much color contrast is OK, how much is ‘wrong’? Almost all colours ‘work’. Just err towards black or navy buttons if wearing mostly formally with black shoes. And dark to mid-brown otherwise. The lighter the button, the more casual it is. I’m pleased you offer a review of buttons. Now I wait to hear from Olivia Massey for her approval my wish not to have sleeve shortening and waist expansion of my G&H RTL 50% silk 25% cotton 25% linen grey hopsack jacket which I just bought on sale not to be ruined in Basel Bern or Freiburg, but in absence of me at G&H. The nice man on the phone at Benson & Clegg offered to bring the set of antiqued silver St George over Reptilian buttons to G&H so when the jacket sleeves are shortened these metal buttons can be sewn on. Comment? Didn’t get through to you first time, so trying again. No black buttons please, just very dark charcoal. Matte, but with a polished edge. Fantastic Simon, exactly what I have been looking for. Where can you recommend for me to take my jackets to have the buttons replaced by the ones from B&B? I think dirrerent buttons can work wonders on a casual jacket. I have a deep blue linen which had dark blue buttons on it but it just looked muddy. I had them changed for a milky grey mother of pearl with a bit of texture running through them and it transformed it totally. Dear Simon, yes, replacing buttons can’t go easily wrong unless the Swiss-German seamstress overlooks the loose button she put in the N&L jacket pocket and takes one from her stockpile she imagines resembles it. Do you think any alterations tailor in Switzerland or Germany can shorten sleeves and expand waist on a RTL jacket made by Gieves & Hawkes? I offered to send a N&L (or E&R or Purdey) jacket to G&H as help to shorten sleeves and expand waist, but G&H Customer Service refused because G&H cut is different (?). I’m waiting to hear from Olivia. It’s not a complicated job, but easy to make a mess of if you don’t know what you are doing. The shank of the closing button needs to be the right length; using a broken matchstick provides the answer. For a sports jacket, what size buttons do I need for the front and cuffs? The general system is French and refers to the ‘ligne’. 40 ligne (40L) is exactly one inch. For most suits and jackets, you want 32L for the front and 23L for the cuff. Blazers are sometimes bigger, and most Savile Row tailors actually use 30L, which is a little smaller than the Italian or French. Would you say 30 for the front and 23 for cuffs would be ok for a sports jacket? Bernstein don’t do a 32. And 23 for the cuffs would be fine for sports jacket cuffs? Reason I ask is that you mentioned “most suits and jackets”, 23 for the cuff. Any instances where 23 would be inappropriate for a sports jacket cuff? Great article. Really what PS is about. Buttons are so important. Happily A&S do a great job and you are so correct, our Italian brethren have absolutely no idea when it comes to this most important of points. Drawing again the attention of PS readers on this small, if very important, item in menswear is a good idea. It’s really stunning how buttons could literally enhance the style of a jacket! Presumably, buttons are the least expensive items in menswear, but with the most important impact on style! While it’s no longer around in its original form – the Italian RTW, MTM, and bespoke suit-maker d’Avenza had the best selection of buttons I’d ever seen (outside of an actual button shop). D’Avenza is the one place you could be paid in buttons – wild Indian buffalo horn buttons – and be happy about it. They cost a fortune. 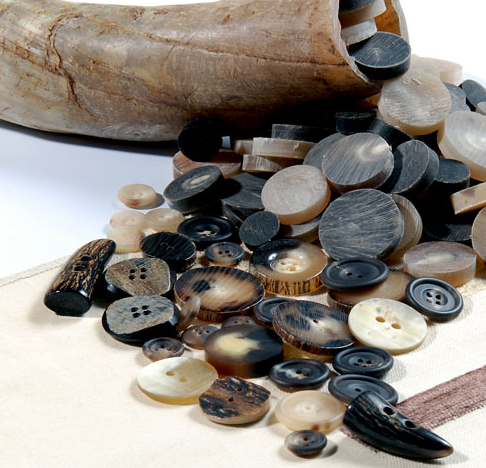 The buttons of buffalo horn (deer horn is too weak, and less delicately patterned) are attached by a thick shank of Chinese silk, spun in Italy. They are designed to last the life of the garment. The buttons on the cuff of the jacket actually undo. It’s a little touch that once allowed doctors to attend to patients without having to take off their jackets. I don’t intend to seek out a career in medicine, but it’s a detail I like. I read the Duke of Windsor preferred no buttonholes but the journalist didn’t provide the reason. The naive und unfashionable presume the intention were to leave the buttons undone, but I guess they decide on one or two either because they were unfashionably advised or saw, and three or four unbuttoned seems either two sloppy or nowhere done. I think the alteration to cut and sew eight jacket sleeve buttonholes costs about £80 or CHF100. No, it’s a personal thing but it always reminded me of cheap suits, where they seemed to spend more money on working cuffs than on a decent collar. I dislike “working cuffs” on a RTW jacket as they make it difficult and expensive to do a very common alteration – changing the sleeve length. Might I suggest the Italian tailors look into these button makers. They really should be using matte horn buttons, as polished horn buttons use artificial chemical processes in the manufacture. Any guidelines on button choice? Would I be correct in assuming that contrast between fabric and buttons would be more casual and low contrast more formal? What are your thoughts on light tan buttons with faint marks against mid grey tweed? And the cloth is on the below page. The fabric supplier has some cracking tweeds! Simon – Not many people have heard of or know http://courtneyandco.uk. but its a new(wish) enterprise making buttons. They started off just making corozo buttons but are expanding their offering I believe. 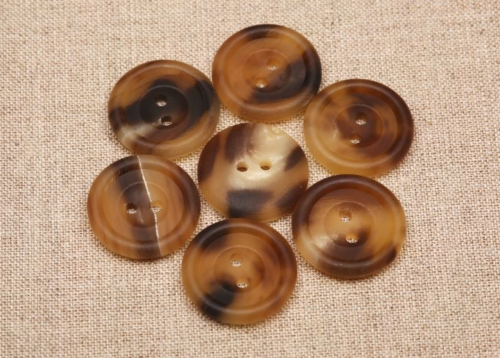 Most buttons are now made in India and China and its difficult for most tailors to order them as the MOQ are high but it would be great to get a UK maker to thrive. I’d like to replace the cheap-looking buttons on one of my RTW suits with quality buttons from B&B. But I just can’t motivate a £25 shipping cost to Sweden. what size of buttons are usualy used on Greatcoats, Overcoats and so on … on bottom pleats as per the Martingale style? What size are you usally using? would you be able to share which cloth the the jacket was made of (where only the cuff is shown)? Thank you very much, Simon. Much appreciated. What would be your recommendation for an overcoat I am having commissioned with W&S? Cloth is a wonderful mid to dark navy blend (70% wool, 10% alpaca, 10% mohair, 5% silk, 5% polyamide) from Vitale Barberis Canonico (Product Code 285.511/5). I’ll go with gauntlet cuffs but have been weighing up a fly front and just having them use any button versus going with a nice button and having them show. Cut is a fairly classic single breasted design with 3 buttons front and a fourth on the lapels. Personally I like to have buttons show, just because I like buttons so much.